To All the Boys I’ve Loved Before is a beautiful story. I had barely finished it before I was ordering its sequel—that’s how good it is. Plus, I absolutely HAD to know what happened! I don’t understand how people who read the first book when it came out could wait so long to know the ending. I was dying just waiting two days! Despite my anticipation, I was let down when I read this book. I guess Jenny Han and endings just don’t mix. 1) In my high school we only had one instance of this happening and it was immediately dealt with and no one actually saw anything. 2) Going along with my high school thing, most of the teachers and students would have been aggravated by the culprit or the post-er, not the victim. 3) I think this trope is overdone by authors who are older and don’t really understand what it’s like for teenagers in high school. They think that it’s all bullies and mean girls with phones and internet access. And that’s just not true. So, once I knew that this book would be all about that ridiculousness, I immediately lost some enthusiasm. 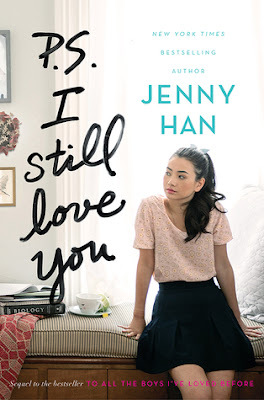 I also didn’t like that this book made Lara Jean seem a little less like a regular teen girl and more of a girl set on revenge. Her entire storyline just didn’t add up to what I had pictured her personality to be. I did like the part about the childhood friends getting back together, but the way it played out made me hesitant. John just wasn’t a character I cared to get to know about, I mean we’d already been introduced to two guys—Josh and Peter—and I didn’t want a third one in the mix. All in all, this book let me down. Jenny Han always comes up with these amazing first and sometimes even second books but the finale always leaves me disappointed. I’d still say that you should pick up this sugary sweet duology, if only because the first book is so tooth-rottenly delicious! *Note: I purchased a copy of this book for myself. I agree the sequel's vibe was quite different from the first one! To All The Boys I've Loved Before made me melt with how sweet it was. And I actually missed Josh in the second book. Even though I prefer Lara Jean and Peter, I still wish Lara Jean and Josh could have maintained their friendship better. Random Book of Choice Giveaway!